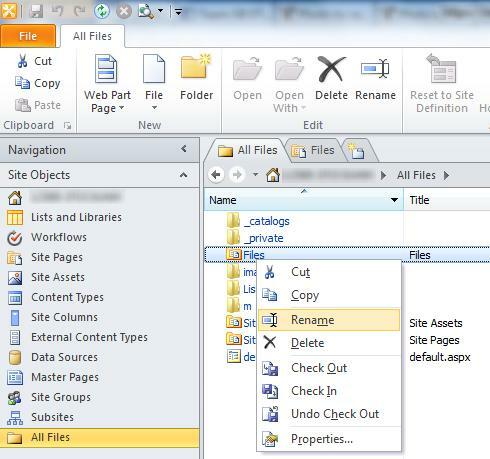 The SharePoint 2010 online management / editing options are excellent for most common tasks, but sometimes you have to resort to the excellent SharePoint Designer to get the job done. One of the most common examples of this is the requirement to use SharePoint Designer should you need to edit the URL of any “List” or “Library”. This is only possible via SharePoint Designer. There is simply no way to change “internal” URLs within an existing workspace from the online GUI itself. You can change the URL of the workspace itself quite easily via the web interface, but not of any constituent libraries or lists. 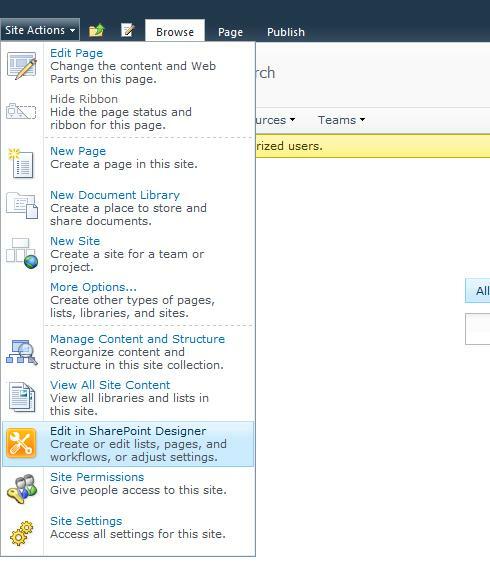 OK, once you have it setup on your system open up your SharePoint site and navigate to the relevant workspace. Now simply select “Site Action” -> “Edit in SharePoint Designer”. This will open your workspace up for you inside SharePoint Designer, ready for you to get in there and actually change internal URLs themselves. To change the URL, and not just the library title, select “All Files” from Designer’s left hand list and find the relevant library, now right-click it, choosing “Rename”. Edit the name for the “folder” / library and then save your changes. This will now not only change the URL itself, but importantly also propagate this change to the all the parts of SharePoint that need to know about such modification to keep things running smoothly. This process will enable you to, amongst other things, rename everyone’s favourite “Shared Documents” to something more sensible like “Files” saving you a considerable amount of wasted “path length” within the full URL, enabling you to use longer file and folder names within a more complex structure in this directory before hittingSharePoint’s dreaded 255 character limit for URLs. (NOTE: “Shared Documents” -> “Files” actually delivers a saving of 13 characters due to “space” being represented by 3 characters; “%20”, when encoded for URLs, this is not only a significant saving to URL length, but also offers a much nicer looking URL as the ugly “%20” will no longer be required).